1. In partnership with Cadence Senior Living, Ryan Companies US, Inc. is designing, developing and building Azure Mesa, an upscale senior living community with an “age-in-place” model that will accommodate a total of 170 private pay, market-rate units. The joint-venture project will consist of 142 independent or assisted living units and 28 units devoted to memory care. Construction on the 183KSF project is now underway and expected to be complete in Summer 2019. 2. Wadsworth Development Group in partnership with Accelerated Development Services held a ribbon cutting and grand opening ceremony at The Crossing at Sahuarita Shopping Center in Sahuarita. 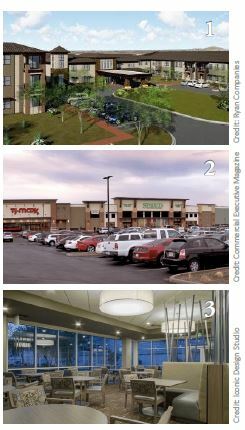 The 150KSf center boasts a Sprouts Farmers Market, TJ Maxx, PetSmart, Beall’s Outlet, and several restaurants and shops to compliment the diverse tenant mix. The project is located at the southeast corner of Nogales Highway and Abrego Drive in Sahuarita, which is about 20 minutes south of Tucson. 3. Iconic Design Studio continues to provide comprehensive interior design services for diverse client projects including a suite at Barrow Neurological Institute for a cutting-edge radiologist using artificial intelligence; satellite suites at Cancer Treatment Centers of America; a 15KSF new headquarters for the Arizona Care Network; and a 125KSF senior assisted living facility.